This wonderful and aromatic spice was traditionally picked from the flowers of the evergreen clove tree found in Moluccas, Indonesia and then dried to make the familiar clove bud used by people worldwide. In history, the clove became favoured by the Chinese, who are recorded to have been required to chew on clove buds before having and audience with the emperor or aristocracy. Pomanders were made by the Victorians at Christmas time for a unique spicy warming aroma and as decorations, using whole clove buds to pierce into oranges. Ribbons were then used to hang them around the home as this was a natural way to fragrance the rooms and achieve all the health benefits described below. Clove essential oil is a particular favourite of ours during the festive season; this humble yet world-renowned spice boasts a wealth of warming, antiseptic and anti-inflammatory properties, just to name a few. Clove can be effective in helping to treat a variety of conditions or ailments such as toothaches, ulcers, acne, athlete’s foot, scabies, bruises, burns, cuts, arthritis and many more. The essential oil contains very potent natural active ingredients such as a-pinene, p-cymene, linalool, eugenol and methyl salicylate, which means that clove oil is considered to be a potent botanical form of antibiotic and antiseptic. It also has antioxidant and antiviral properties and can even be used as an aphrodisiac or a stimulant. Due to the strong beneficial properties of this spice, we usually find that when used during the winter months, it may indeed help to reduce the chances of the common cold or flu rearing its ugly head and landing you feeling bunged up and stuffy headed. Clove essential oil is also contained in our very own “Bugs at Bay Bundle” because of its antiviral and antibacterial properties. This pack is designed to help bring some immune support into the home through the use of powerful antiviral essential oils that can be added to an oil burner, used as a natural surface cleaner (when watered down), as a room spray and much more. 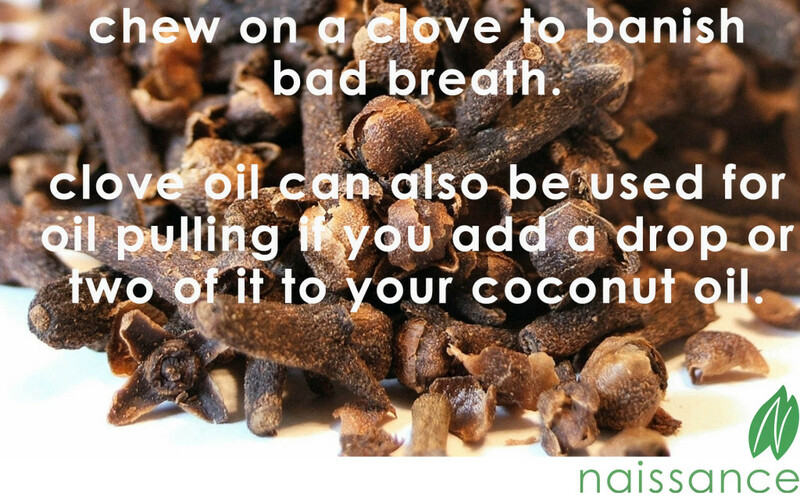 Bad breath - chew on a clove to banish bad breath. Clove oil can also be used for oil pulling if you add a drop or two of it to your coconut oil. Insect repellent - especially effective to repel ants. Stress relief - the aphrodisiac nature of the spice can help soothe stress or tension. Carpet freshener when combined with Bicarbonate of soda.